For years, we've walked past the Sur La Table cooking studio and thought we should take a cooking class there. The setup looks so professional, the chef looks so wise and the students all look like they're having a great time. Finally, Shira took matters into her own hands and actually signed us up. 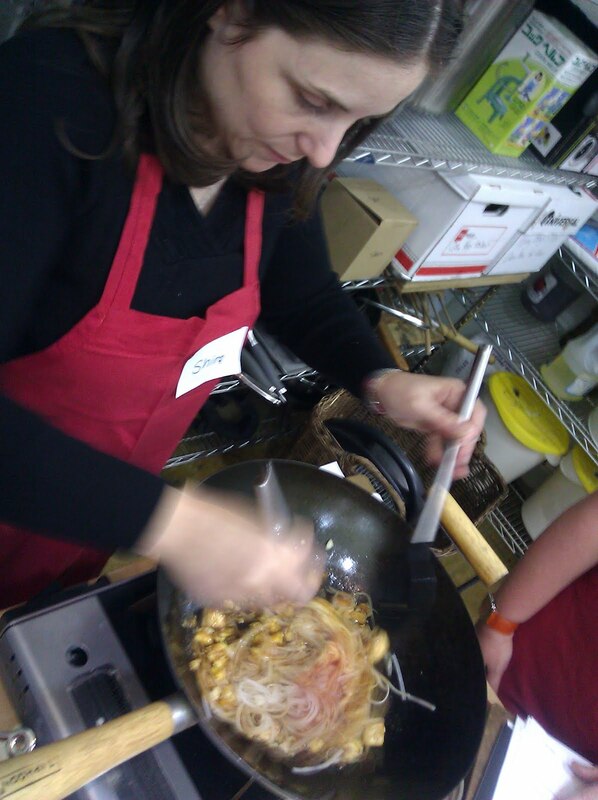 The result: last night we attended an Asian Noodle class. I have to admit, things didn't start off so hot. We arrived about 10 minutes early, and they told us to wander around and give them more time to setup. No problem. After the requested 10 minutes we returned to find a full classroom. There were indeed two spots left, but at different cooking tables. I also couldn't help but notice that there were big chunks of beef on each table - not a great sign when I was hoping to cook vegetarian that evening. Luckily, within a few minutes, we had things mostly resolved. An individual from one table switched with Shira, and that at least put us at the same table. And then the class began. I was expecting thorough instruction, lots of demonstration and everyone at the table to be doing the same thing. Something like: "here, let me show you all how to dice up the garlic. Now, everybody grab their garlic and do the same." And that's exactly how it *didn't* work. The chef walked through a couple of recipes we had in front of us, and told our tables to get to work. This was definitely learning by doing. At first we were all kind of hesitant about who should do what, but within a few minutes, we had some progress made. And by the end of the night, our table was a finely oiled cooking machine. And that big chunks of beef on table? Yes, they got used two different recipes, but three others were vegetarian. And it just so happened that another person at our table was also a veggie. All in all, the experience was quite good. The recipes came way too fast and furious for my brain to keep up, but it sure was fun to see that making something like Pad Thai or Lo Mein was actually doable by mere mortals. The team at Sur La Table was definitely top notch, as there were quite a few helpers around to clear dishes, provide us with any utensils or supplies we wanted and answer questions. Ask questions. 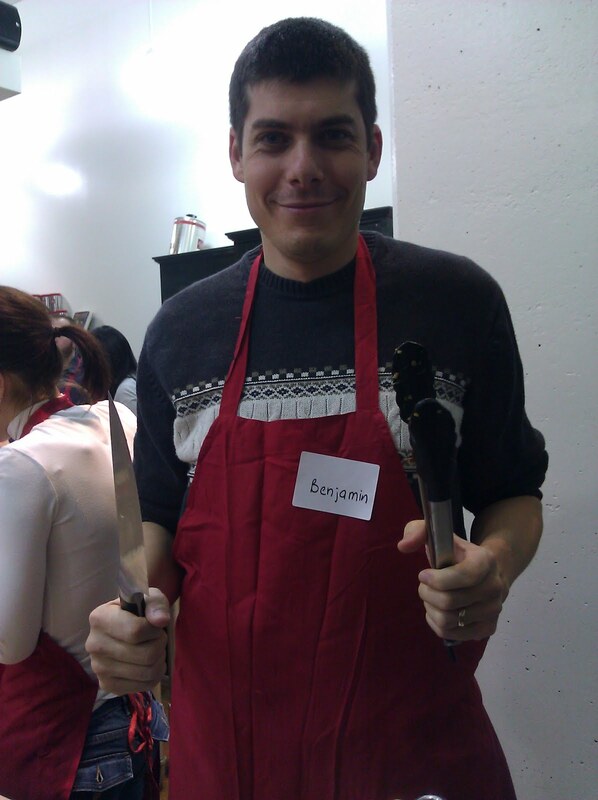 Our chef was glad to teach us, but he needed us to have the courage to ask. A question about cutting onions turned into a slick demonstration about how to neatly slice them. A question about ginger revealed that pealing the outside with a spoon is ideal instead of using a knife (less chance you'll cut yourself or damage the ginger). A question about noodles being ready taught me that breaking them in half and detecting a white core means they aren't quite there. It's no fun looking like an idiot in front of a room full of strangers, but asking questions definitely made the difference in getting real value from the clss. Your table mates matter. In our case, the strangers at our table were all quite nice, and wanted to learn (versus showing off what they knew). I could see some advantages of going as a group to one of these classes to insure that you had solid fellow cooking mates. But, it's also a nice to let serendipity happen, and just go with the flow. The class was definitely more of a team sport than I imagined. Enjoy! Like I said above, for me, this was all really overwhelming. Once I accepted I wasn't going to soak up every bit of information, I was able to relax and really enjoy it. Don't be afraid to go off script. 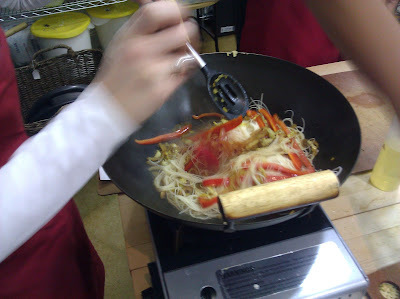 When asked, they provided us with veggie broth and a separate wok to cook veggie dishes in. All we needed to do was ask. Of course, I'm sure there are requests that are beyond what they could meet - but I was impressed at how the chef was glad to think on his feat and adjust the recipe to meet what our table wanted to cook. Definitely a fun thing to do!